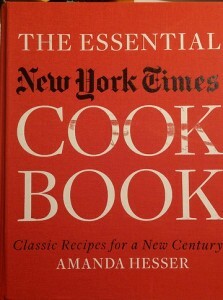 Amanda Hesser, The Essential New York Times Cookbook, W. W. Norton & Company, 2010. Steve got me this for Christmas in, I think, 2011. 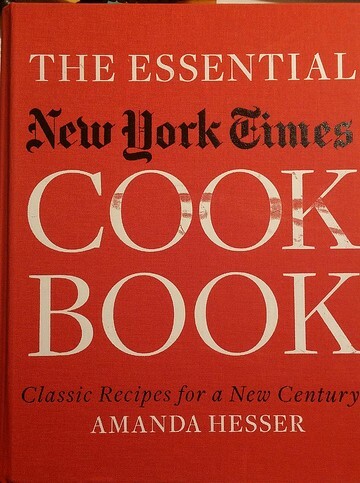 It’s one of the few cookbooks that I just pick up and explore, looking for that recipe that I “just have to try someday.” Hesser assembled the recipes from the NY Times archives – a Herculean task – and reading it is dipping into American culinary history. It does have some of the favorites we’ve collected from decades of subscribing to the Times – including “Teddie’s Apple Cake” (already posted here). Unfortunately, we haven’t broken out of our rut to try too many others — but there’s lots of cooking ahead (and many recipes already flagged). Lots of reference material – like conversion tables, substitution tables and recommended temperatures – on the inside covers.